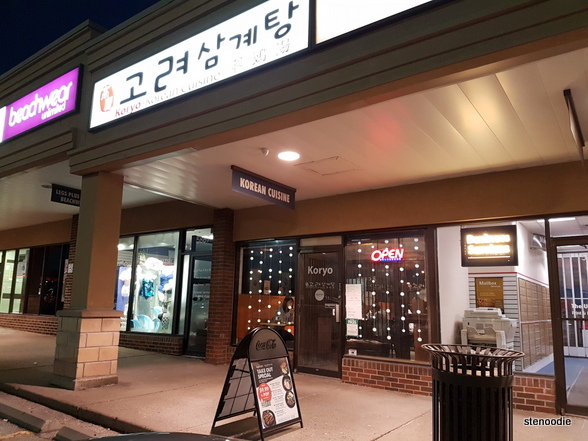 March 19, 2019: A hungry belly after a day of work called me to Koryo Samgyetang, a Korean restaurant located on Leslie Street south of Steeles Avenue in North York. 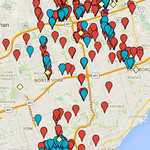 I had this restaurant on my to-try list after noticing their high reviews for a while but wasn’t in this area often for it to be convenient to go. 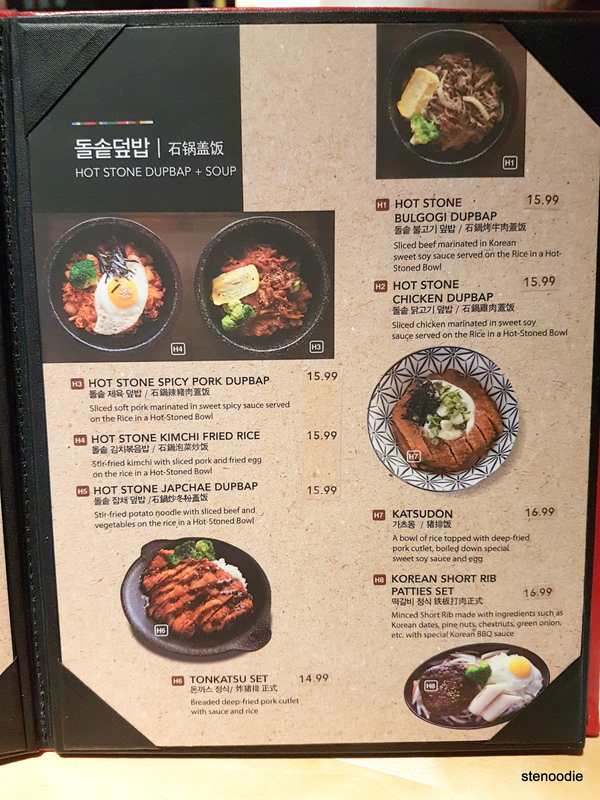 Finally, I got to try this place! 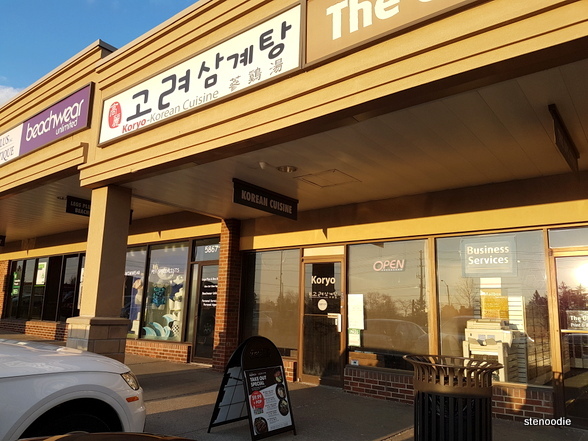 Koryo Samgyetang is located in a small and non-descript plaza with a Pickle Barrel and Tim Hortons. 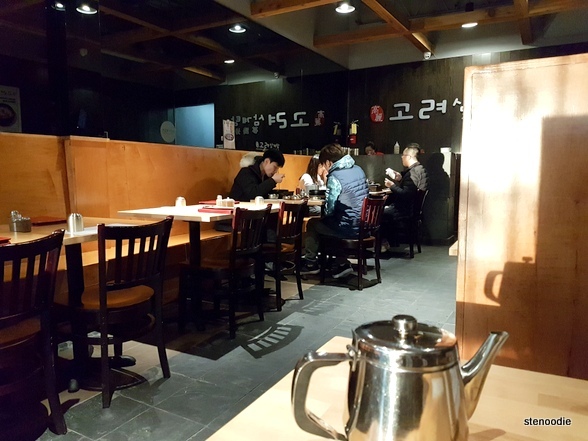 The storefront of Koryo Samgyetang is extremely small and hardly noticeable (especially during the day time; their night signage was easier to see). Once inside the restaurant though, I was so impressed with how big and cozy it was! There were tables lined up along both sides of the restaurant with a long and wide walkway for the servers. It was hard to believe that the space inside the restaurant was so big considering how small and narrow the storefront appeared to be. The servers were so warm and friendly. It was definitely a great place to have dinner and unwind after a work day. 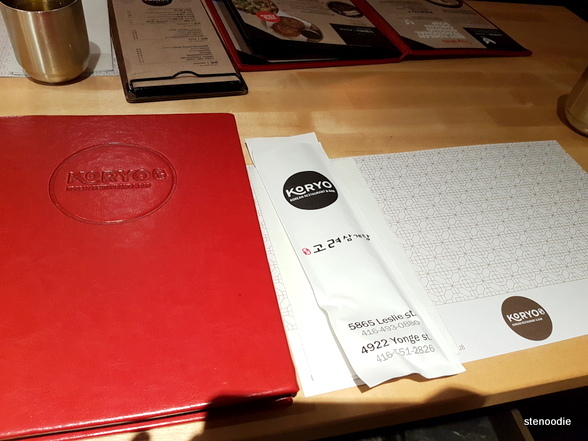 I liked how sophisticated and rich the menus appeared to be. All of their utensils and bowls that evening were spotless and beautiful as well. 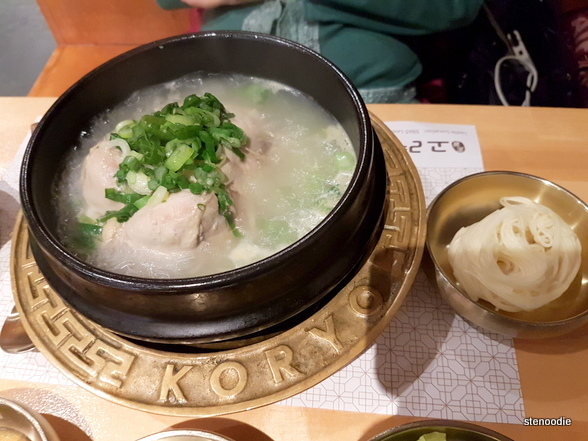 Koryo Samgyetang is known for samgyetang (hence, their namesake), which is ginseng chicken in soup in a hot stone pot. 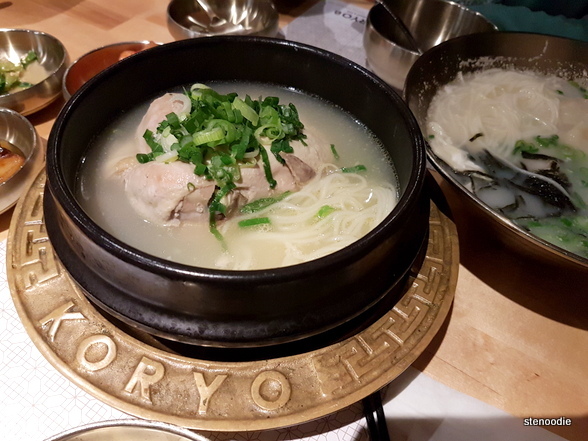 They actually have various types of samgyetang in addition to their original one. 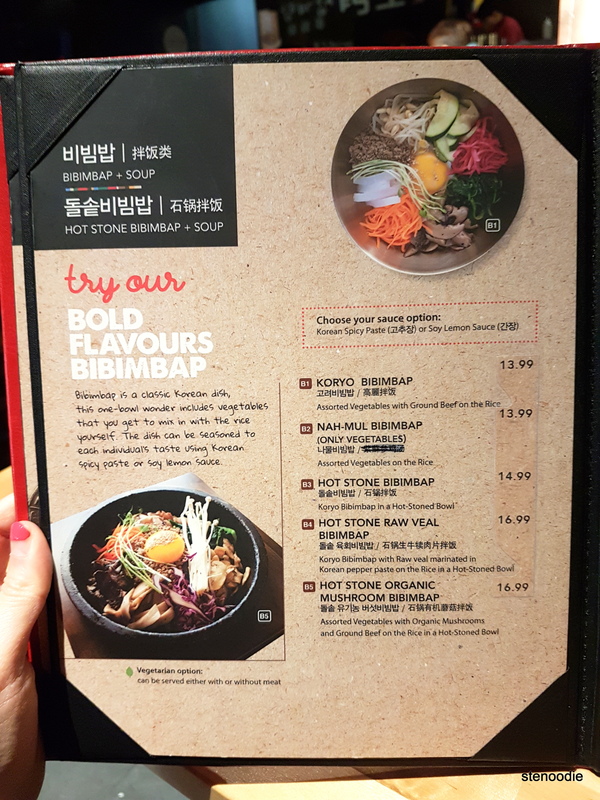 We ordered the original one since it was our first time here. 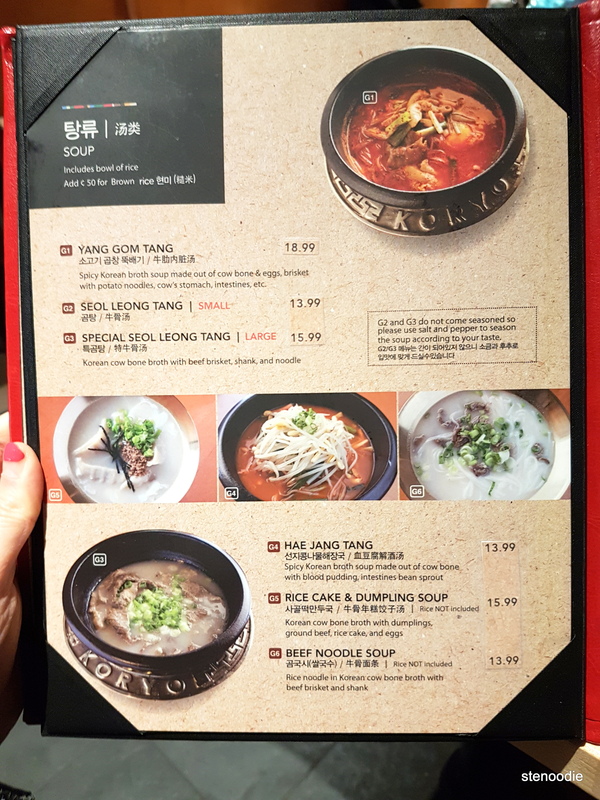 I was feeling some something soupy, so we also got the Rice Cake & Dumpling Soup (with Korean cow bone broth which sounded delicious). 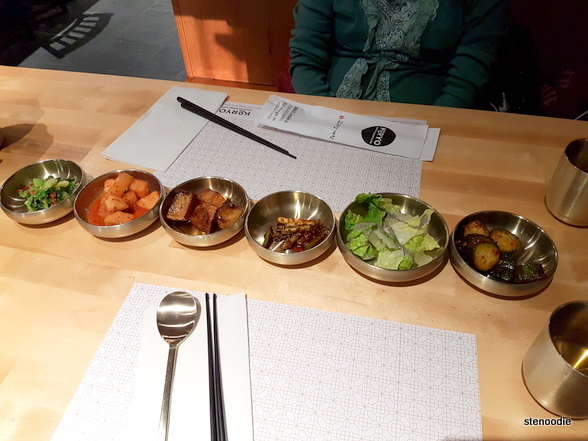 After placing our orders, we were served six different types of banchan. 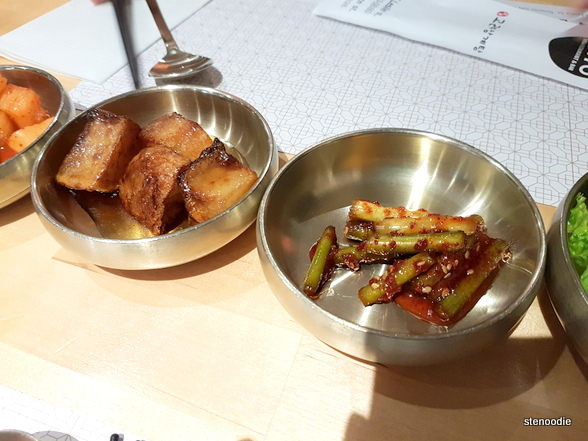 The banchan were ones that I hadn’t seen often in other Korean restaurants. Everything was so pretty and delicate. 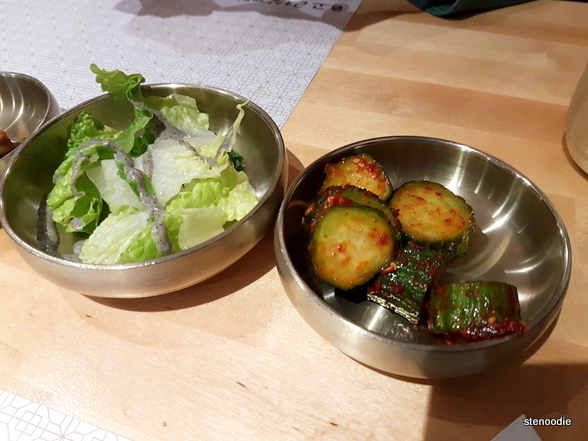 The banchan consisted of pickled baby bok choy, pickled cubed radish, sweetened potatoes, pickled sprouts of some kind, lettuce with a gray salad (sesame?) dressing, and pickled cucumbers. 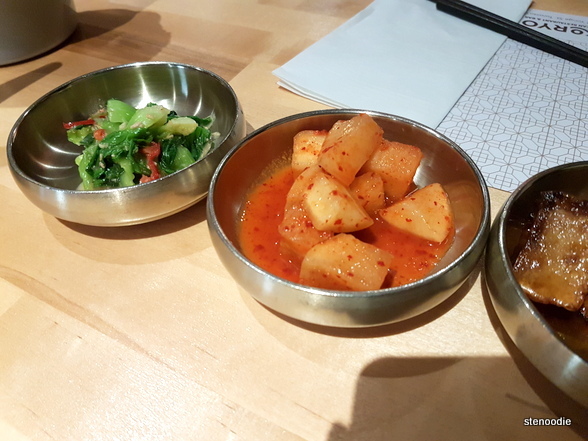 The pickled items other than the lettuce, bok choy, and potatoes were all quite spicy. 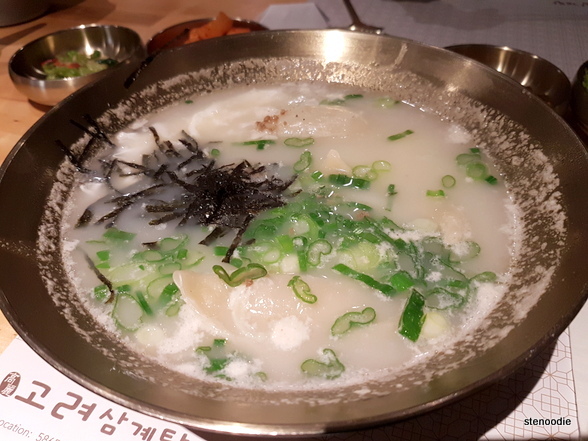 The Rice Cake & Dumpling Soup arrived first and appearance-wise, it didn’t look good at all in my photo (it looks like a big vat of bland soup haha). 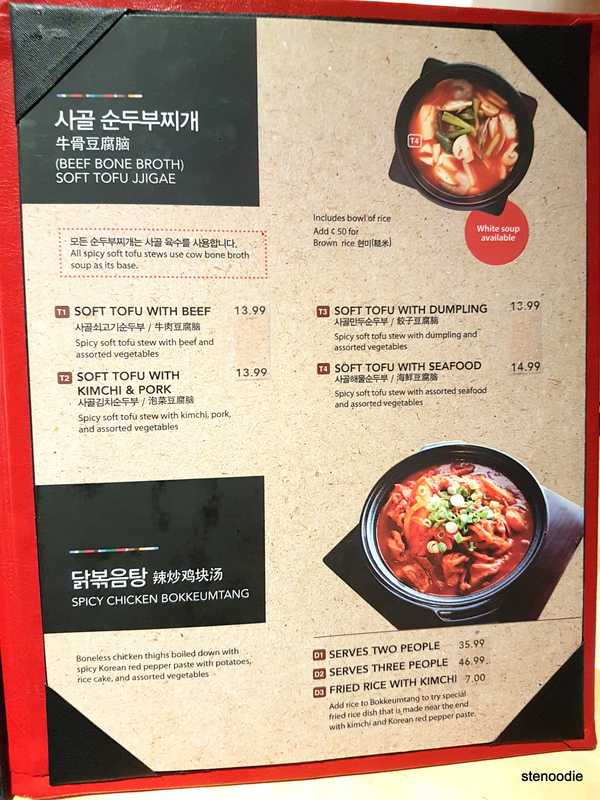 However, it smelled really good and the taste of the Korean cow bone broth was amazing and exactly what I wanted on this evening for dinner. It was so fragrant and infused with flavour (not MSG). It had lots of rice cakes floating in the soup as well as several dumplings with ground beef and eggs. I really enjoyed this dish. -one whole young chicken stuffed with ginseng, sticky rice, Korean dates, chestnuts, herbs, etc. 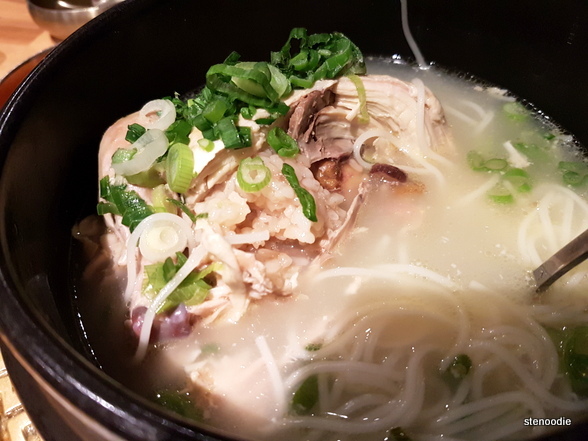 Mmm, this samgyetang smelled really good. 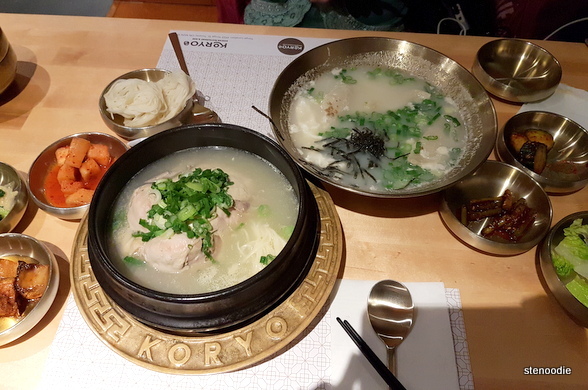 The broth in this was not as flavourful as the Korean cow bone broth in comparison. The young chicken was quite tender, and this was a very filling dish. We didn’t end up finishing it. We couldn’t finish both dishes, so we packed it up for another meal to enjoy at home. 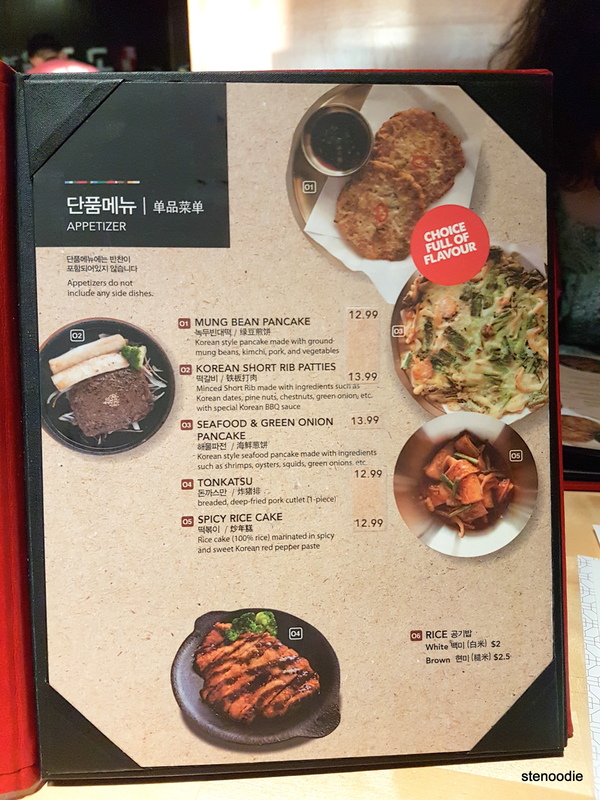 I’m so glad that we were able to try out this Korean restaurant! I’d come back to try their other dishes! 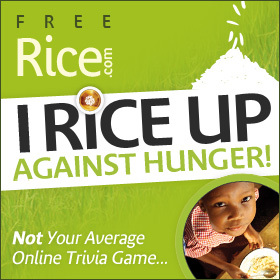 A great place to hangout and share their big portions of food with friends or family! 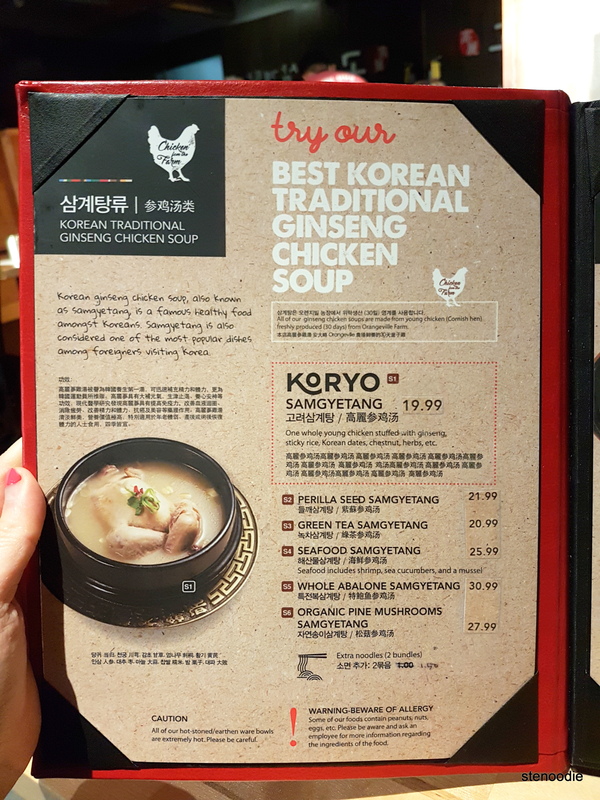 This entry was posted in Food and tagged 5865 Leslie St, chicken stuffed with sticky rice, food blog, foodie, Korean, Korean chicken ginseng in Toronto, Korean cow bone broth, Korean restaurants in North York, Korean rice cakes, Koryo Samgyetang, Koryo Samgyetang banchan, Koryo Samgyetang food reviews, Koryo Samgyetang menu and prices, North York, restaurant review, Rice Cake & Dumpling Soup, Samgyet'ang, Samgyetang chicken ginseng, Toronto food bloggers. Bookmark the permalink.